WARNING LONG POST AHEAD! Yes, yes, it’s been awhile. But I warned you in my last post. Work is just insane right now. All good things, but I’ve had to prioritize my time a little. Hopefully it will settle down in a couple of weeks. So what exactly have I been up to? Well besides work, I have been continuing to train for the Baltimore Half, I ran the Charles Street 12, and I got a few new pieces of gear. Lets start with Baltimore training. When we last spoke, I had just wrapped up week 5. I’m now about to start week 10. I just realized I have 4 more long runs until the race. Wow, time sure does fly doesn’t it? Training has been going well, except for the fact that I have unfortunately missed the last few weeks of tempo runs. First it was due to work, then weather, then just pure exhaustion. This past week it was raining in the morning, so I planned to go after work, then I got out of work an hour later than I wanted, it was still rainy and I just bailed (it’s a step back week anyway.) Or so I reasoned. I’m recommitting this week, so it will get done, come hell or high water. This week I’ve got a track workout Tuesday, tempo on Thursday, and 12 on Saturday. I have to be honest though, I’m so sick of training. I’ve been training for races since February. In May it was the Frederick Half, then in June it was the Baltimore 10, and then last weekend it was the Charles Street 12. 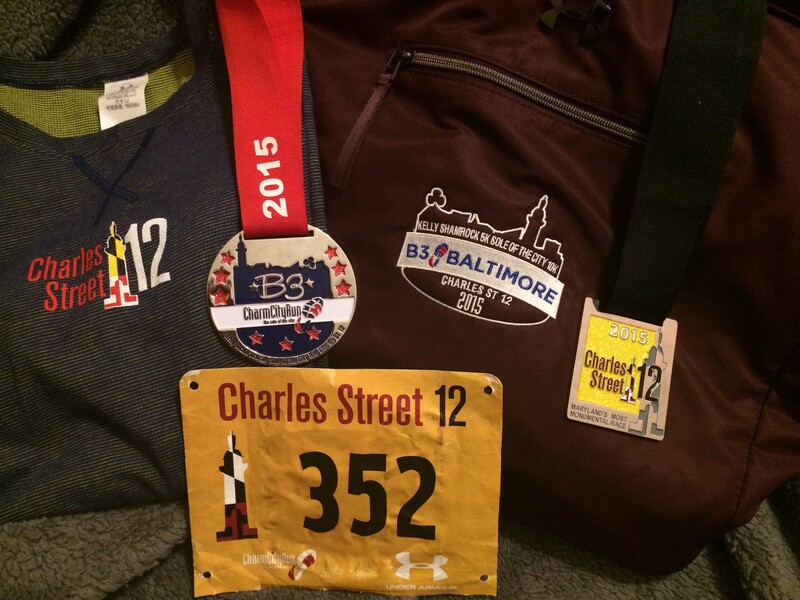 The Baltimore Half will be my last long distance race and I’m so glad that I’ll be done with it for a while. I need a break from long distances. If I was just running for fun, maybe I’d feel differently. There is just pressure (self-imposed) to perform and run well, so it’s just been a bit draining. Next on my adventures over the past month was the Charles Street 12. Facebook followers got this last week. At mile 11.9 I found a small droplet of energy I didn’t know was left and booked it to the finish. I won’t bore you with a full on race recap, because you can read a nice recap over on Salt’s, Lisa’s, and Amber’s (who placed 3rd in her age group wahoo!) pages. But I will share my tale. 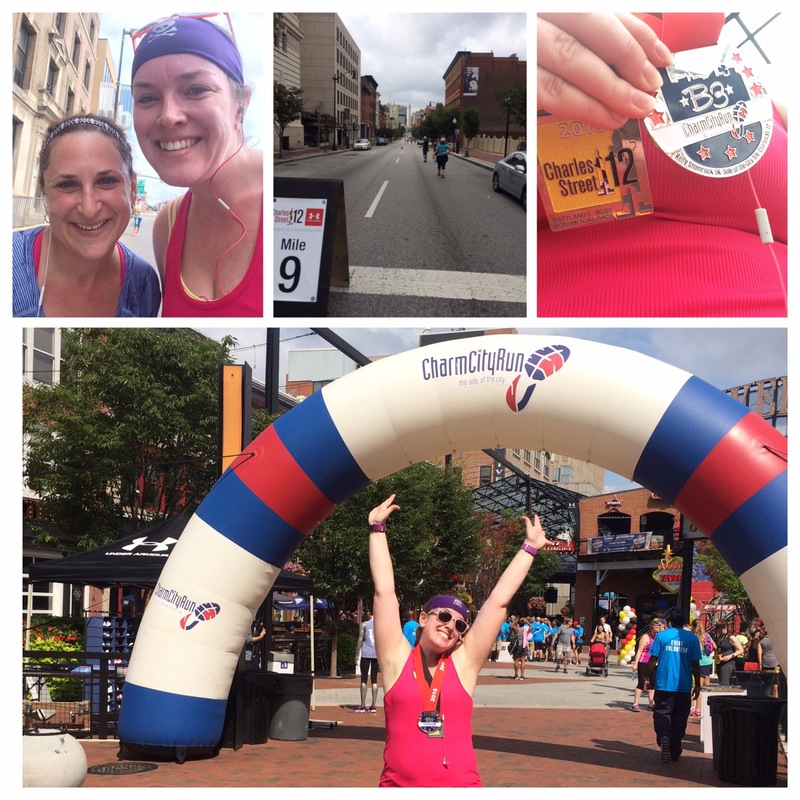 This was the FINAL installment of Charm City Run’s B3 race series. It started north of Baltimore City and for 8 of the 12 miles took Charles Street all the way down into the city. It was my first time running and this race was a doozy. It is net downhill, but that doesn’t mean downhill. 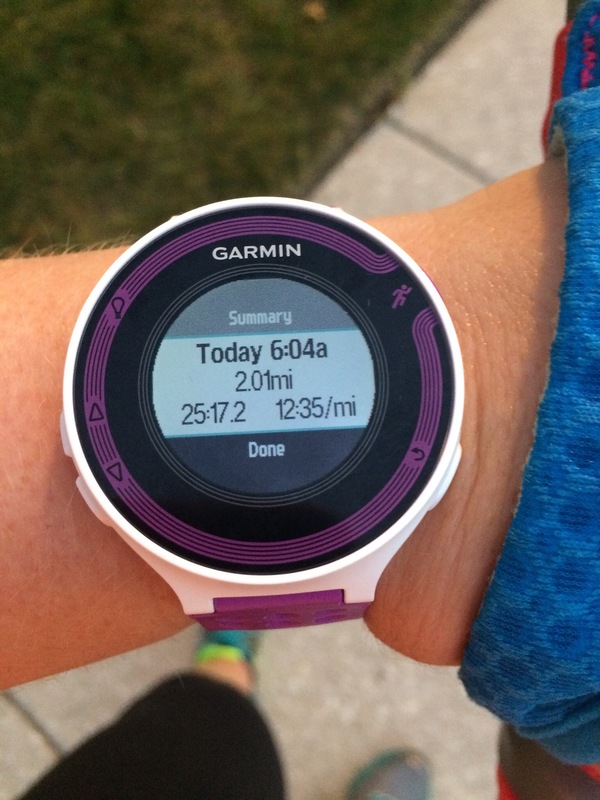 It was a typical Baltimore City run loaded with rolling hills, awesome city views. The weather was overcast, but HUMID! I was running it as a training run, so I wasn’t trying to race it (but I did have a super secret time goal – spoiler alert, I didn’t make it). The humidity got to me as did the need for the bathroom at mile 6. I waited much longer than I would have liked. There were several downhills that I took way too fast and then at mile 10 when it flattened out, I was just dragging. The last two miles were a real struggle for me – the sun had made its way out at that point and there were no more downhills to ride to the finish. Oh well, I made it to the finish in one piece and collected my bling. I felt pretty beat up last week following the race, so I took it easy (step back week as I mentioned). 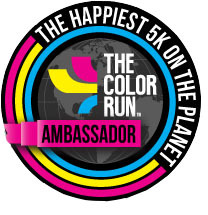 This race was really fun and challenging. 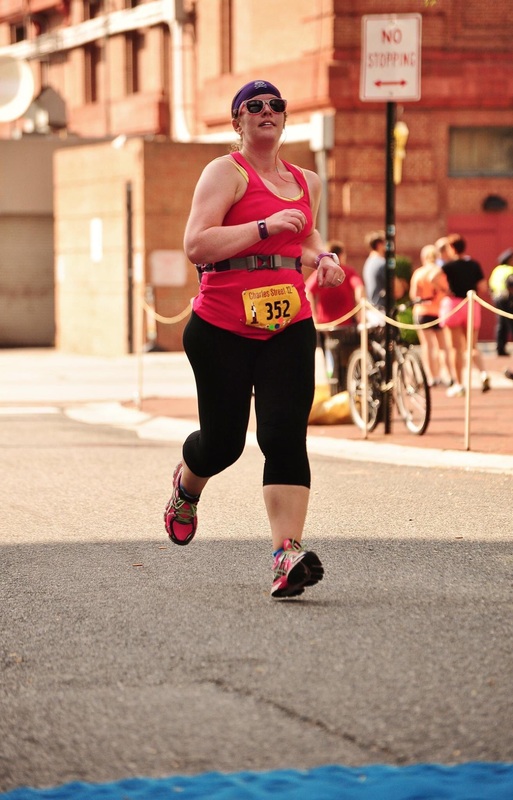 Not sure if I will do it next year or not, but I would definitely run it again – I love my Charm City Run races. The premium was nice, it was an Under Armour waffle long sleeve shirt. It was kinda odd, but I have so many tech shirts it was a nice change of pace. I Will (see what I did there Under Armour?) definitely be sporting it once he weather cools a bit. The B3 premium was a really nice Under Armour gym bag. I think it was originally advertised as a vest so this was a really nice surprise. The color is a weird reddish brown, but whatevs, it’s still a really nice bag. I’ve already used it on an overnight trip Labor Day weekend. Next on my adventures…new gear! Everyone loves new gear…but not new gear they really weren’t in the market for. Like a new Garmin. In my last post I mentioned how my Garmin 110 was acting funky, well Garmin support couldn’t help, so a new 220 it was. I haven’t used all the features yet, but I’m loving the wireless syncing. That is just amazing and so worth it. I’m actually really excited to use the Workout function and download some workouts to try on my own. Next on the gear list is new shoes, no pic yet as I just ordered them today. I’ve been rotating between a pair of Saucony Triumph 11s and ASICS Nimbuses for the better part of the year. I was starting to feel the pavement towards the end my long runs. I actually had been looking for a while, just trying to find a deal. Since I need a wide shoe, its hard to find my size in stock, so I bit the bullet and just got the Nimbus 17s. Now was the time to get them so I can break them in before the half. So I’ll wear these Nimbuses exclusively until I can get a deal on a second pair. 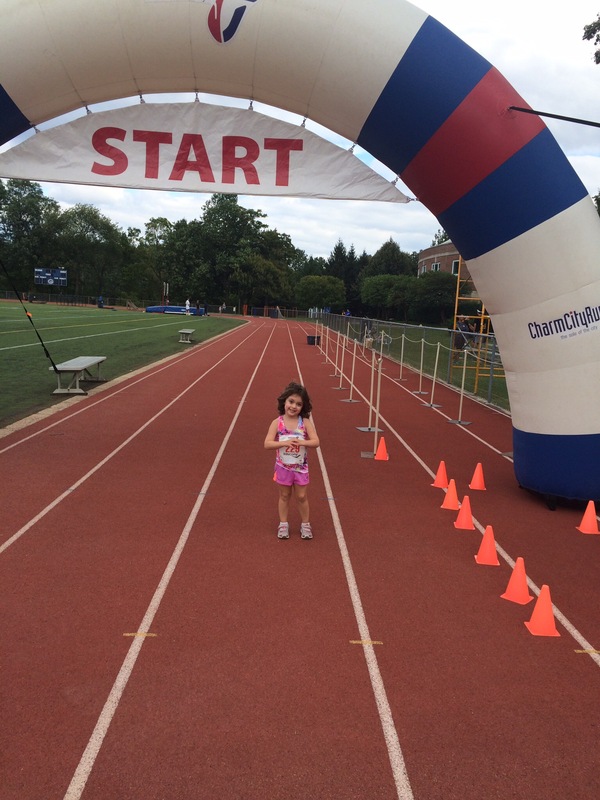 Charlotte ran the first race of the Charm City Run Kids Cross Country Series. To say she was excited was an understatement. She was in the 4 and under age group and they ran one loop around the track. It was so cute. I ran with her and she did such a good job. Before the race I told her that if she gets tired to just slow down, but don’t stop running. Well during the race she stopped a time or two but I encouraged her and we ran holding hands. 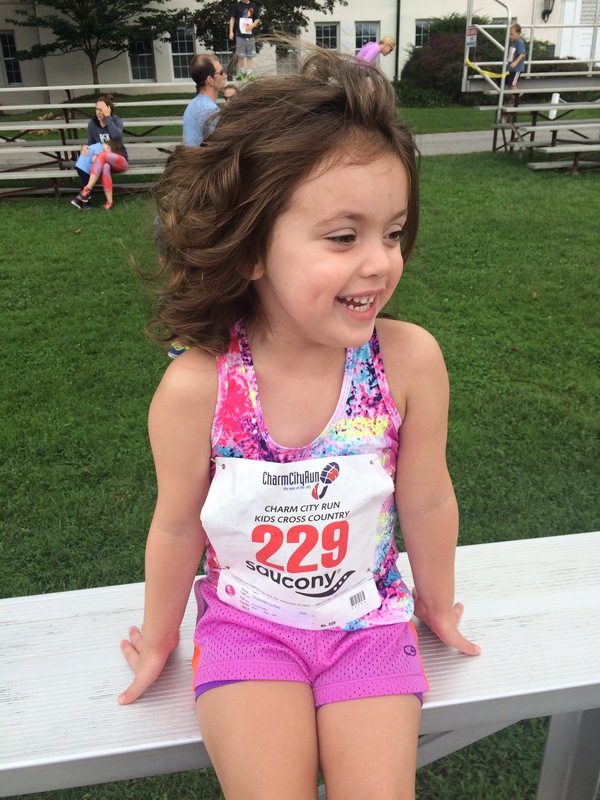 When she made it to the finish – she had the biggest smile on her face. She kept saying “I did it!” It’s not her first kids race, but it was the longest. Our next one is in two weeks. Anyone with the Garmin 220, what’s your favorite feature? How do you break in new shoes? How is your training going?